Check out our Review of the KindLED K5 Series LED Grow Lights! LED lights are made up of many small LEDs, or light emitting diodes,that each project one specific wavelength of the electromagnetic scale. We interpret this as the visible (although sometimes invisible) color of a diode. Plants use and absorb an array of colors from 400nm to 700nm in order to carry out photosynthesis. Many LED companies only use 2-3 of the primary colors needed for photosynthesis and plant growth. Plants that are not receiving their complete lighting spectrum needs can become leggy and produce only wispy flowers. 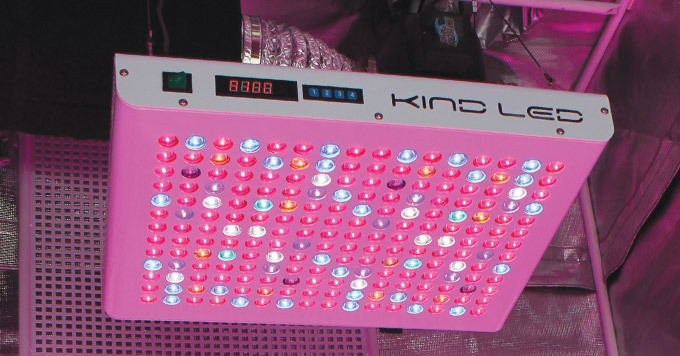 Kind LED Grow Lights feature a complete 12-band spectrum, which includes both infrared and ultra violet diodes that fall outside of the visible spectrum. While invisible to the naked eye, these vastly important UV & IR diodes, along with the rest of our proprietary spectrum, assist in providing your plants every lighting component needed for robust and complete growth, throughout all stages of their life cycle. Another major Kind advantage is the use of the revolutionary “secondary optical lens” which penetrates deep into the plant canopy to reach secondary and tertiary levels, thus maximizing yields by creating a higher overall number of viable dense flowering sites. Our 3 and 5 watt diodes running at a high output optimized driving current incorporate the perfect blend of intensity, efficiency, durability, and low operating temperature, making them the superior choice. Many other LED brands are running with lower diode wattages and lesser driving currents, making them an inferior option when compared with Kind LED Grow Light. Kind LED grow lights are the ONLY 3 Watt grow lights that feature a 12 bandwidth full spectrum LED panel, a secondary high intensity optical lens, and 2CM aluminum circuit boards. These 3 Watt Kind LED lights will match or outperform any other similar 3 watt setup that is seen often throughout the web, regardless of price or claims. GUARANTEED!